We were sent this release by the manufacturer of a new camera strap who thought our members might be interested. I am sending you this e-mail to announce a new camera support system that may interest your members. I attached a Press Release and a Brochure. Feel free to use any information contained in them in your Newsletters or "What’s New" section on your site. My new product is called the BosStrap Camera Sling System. My company is BosStrap LLC. The BosStrap System includes two pieces: a BosStrap™ and a BosTail™. The BosTail replaces the manufacturer’s neck strap. Simply attach the BosTail to the left strap lug or eyelet on the camera body. The BosTail typically remains on the camera. The BosStrap includes a nickel plated metal TriggerLoc™ to connect to a nickel plated ring on the BosTail. Professional photographers tested the BosStrap System for three months in field and studio environments. They unanimously agree that its unique engineering offered the professional photographer benefits that were unavailable with any other system. The BosStrap System was tested with professional camera setups weighing over six pounds when typically equipped with an 80-200 mm f/2.8 zoom lens. The adjustable BosStrap is worn across your body, placed over your left shoulder and under your right arm as shown in the photos in the attached Press Release and Brochure. You’ll notice that the BosStrap is wider than a typical camera strap. The wide nylon webbing is sufficient to distribute the weight of a camera without relying on a cumbersome and roaming shoulder pad. In operation, the TriggerLoc slides along the BosStrap (which does not move) allowing you to effortlessly bring your camera up to your eye to quickly compose and capture the shot. When not in use, your camera remains safely and inconspicuously at your hip. 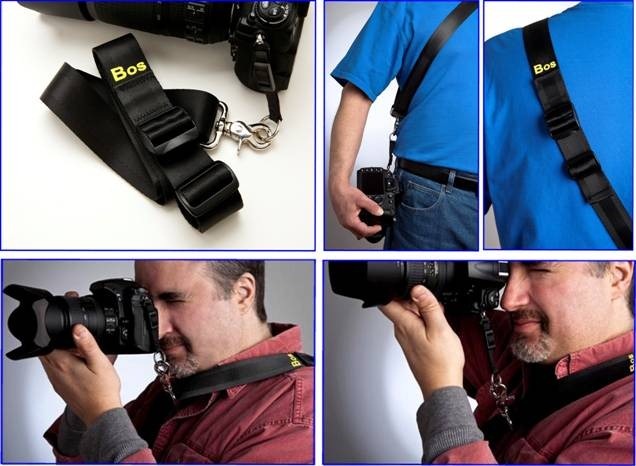 Adjustable BosTail length from 2" to 4"
Try the new BosStrap Camera Sling System. If you are not satisfied, return it with 30 days for a full refund. Please let your members know about BosStrap.